The Lake Havasu Area Chamber Ambassadors held a ribbon cutting ceremony for Sprint by Wireless Experts, celebrating the opening of its new store. Attending the ribbon cutting from left to right were Jen Whetten, Bill Sisson, Vinny Yaldo, Danny Isho, Mark Pena, and Cassie McShane. 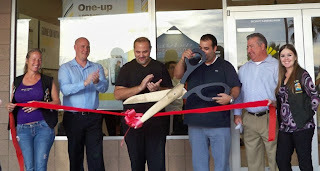 Danny, Vinny and the Sprint by Wireless Experts family are very happy to be back in Havasu. The store is doing everything possible to make Sprint the preferred wireless carrier and hope to achieve that in the near future! For more information visit them at 55 S. Lake Havasu Ave Ste. D.